In today’s guest post, Emerson’s Alan Novak, leader of the alternative energy industry team, revisits the U.S. Renewable Fuel Standard (RFS) and its impact on the industry. The Renewable Fuels Standard (RFS), first signed into law as part of the Energy Policy Act of 2005, established mandates for the use of biofuels in the US transportation fuel pool. The Energy Independence and Security Act of 2007 amended the RFS (now renamed the RFS 2) and substantially increased the volume requirements for biofuels. It also mandated significantly larger quantities of various types of advanced biofuels such as Cellulosic ethanol- and biomass-based biodiesel. Both of these mandates created large potential demand for a variety of biofuel types and should have provided long term drivers for a number of new fuel production pathways (while at the same time supporting current corn based ethanol). Recent developments in the US economy, energy availability and the political environment are combining to bring into question the very existence of these mandates. Economic Headwinds. The slump in the US economy has led to a substantial drop in the demand for gasoline. As shown below, the gallons of gasoline consumed daily in the US has declined substantially from the peak in 2007. Since ethanol is blended into gasoline as an oxygenate at a rate of no more than 10% (85% ethanol blends are available for flex fuel vehicles but represent a small portion of overall consumption), the numbers below indicate a total required annual demand for ethanol of about 13.7 billion gallons (8.9M barrels gasoline/day * 10% *42 gallons/barrel * 365 days). This is very close (or slightly below) current annual production levels and significantly below the RFS target of 15 billion gallons. Energy Availability. As mentioned in previous posts, the discovery of shale gas reserves in the US and the emergence of cheap, abundant reserves of cheap natural gas have significantly changed the dynamics of the energy market. New processes are emerging which have the potential to either replace corn as a feedstock for ethanol production (the Celanese TCX natural gas to ethanol process) due to lower production costs, or to eliminate it entirely by moving away from gasoline as a motor fuel (compressed natural gas – CNG). 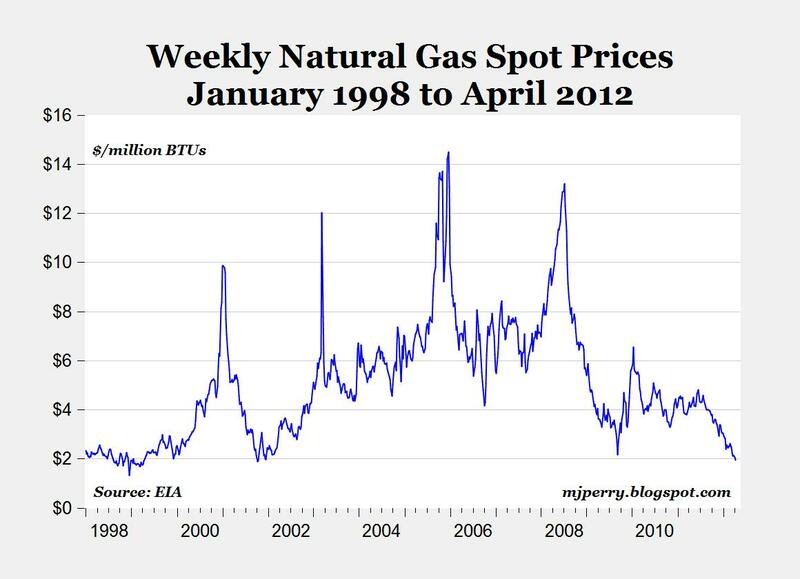 While the cost of both natural gas and corn has been declining, the drop in natural gas has been more dramatic. Political Headwinds. Congress is also showing a renewed interest in re-visiting the entire concept of a Renewable Fuels Standard. As highlighted in the May 30 edition of Biofuels Digest, a Senate study group is being formed to review all provisions of the Renewable Fuels Standard. The conclusions and recommendations of this group will likely have a profound impact on both the content and very existence of the RFS. So what does all this mean for the future of the RFS and biofuels in general? Only time will tell, but the biofuels industry in the US is clearly entering a very challenging phase of its existence. Posted Friday, June 8th, 2012 under Energy.